Sub : Constitution of Committee to examine classification of Railway Posts consequent upon implementation of 7th CPC recommendations through RSRP Rules,2016. Railway Board’s order dated 12.06.2018 refers (Annexure-I). 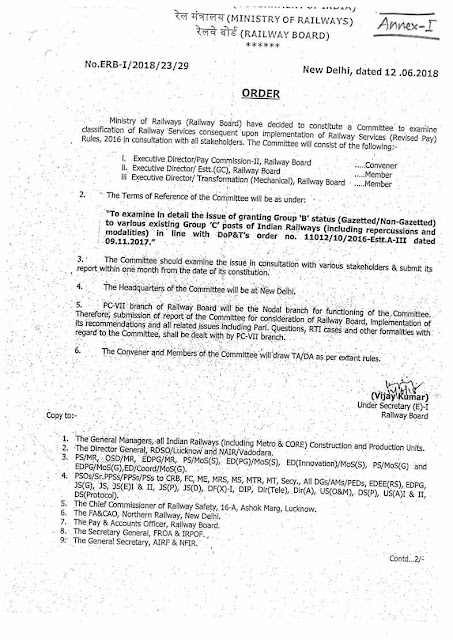 A Committee consisting of Executive Director/Pay Commission-II Railway Board as Convener, Executive Director/Estt. (GC) Railway Board and Executive Director/Transformation Cell (Mechanical) Railway Board as Members has been constituted “to examine in detail the issue of granting Group `B’ status (Gazetted / Non-Gazetted) to various existing Group ‘C’ posts of Indian Railways (including repercussions and modalities) in line with DoP&T’s order no. 11012/10/2016-Estt. A —III dated 09.11.2017″. 2. It is requested that the above be circulated among all the stakeholders in the Zonal Railways. Their comments/representations if any in this regard can be directly addressed to the undersigned at Room No. 325, 3rd Floor, Railway Board, DFCCIL Building, Pragati Maidan Metro Complex, New Delhi- 110001. The relevant envelopes may clearly be superscribed with “For Committee examining classification of Railway Posts” on top. 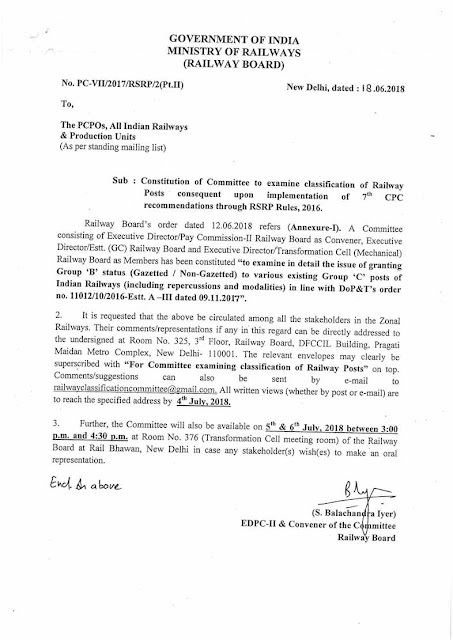 Comments/suggestions can also be sent by e-mail to railwayclassificationcommittee@gmail.com All written views (whether by post or e-mail) are to reach the specified address by 4th July, 2018. 3. Further, the Committee will also be available on 5th & 6th July, 2018 between 3:00 p.m. and 4:30 p.m. at Room No. 376 (Transformation Cell meeting room) of the Railway Board at Rail Bhawan, New Delhi in case any stakeholder(s) wish(es) to make an oral representation. 3. The Committee should examine the issue in consultation with various stakeholders & submit its report within one month from the date of its constitution. 5. PC-VII branch of Railway Board will be the Nodal branch for functioning of the commission Therefore, submission of report of the Committee for consideration of Railway Board, implementation of its recommendations and all related issues including parl. Questions, RTI cases and other formalities with regard to the Committee, shall be dealt with by PC-VII branch. 6. The Convener and Members of the Committee will draw TA/DA as per extant rules.